SegaSonic Bros. is a Sonic the Hedgehog arcade puzzle game for Sega System C2 hardware, originally set for release in 1992. While "finished", the game failed its location test in Japan and subsequently did not see a nationwide release. The game was designed by Fukio Mitsuji, the creator of Bubble Bobble. Gameplay consists of dropping multi-coloured Sonics to create lines and clear pieces. Unlike traditional matching puzzle games, SegaSonic Bros. has players creating lines and loops using the different colored Sonics. Creating a line can be done by connecting Sonics of the same color across, diagonal, above, and below one another. Pieces drop from the top of the board in groups of four, with the colors randomly mixing after each drop. The object is to eliminate as many pieces on the board at once as possible. A bonus is awarded when the entire board is cleared, which multiplies the score depending on how big of a combination was executed. At every ten levels, the player is awarded a Chaos Emerald. Once the Chaos Emerald lands on the board, it will eliminate everything above and on the same plane as it. The background and music also changes after every tenth level, going through each stage of Sonic the Hedgehog, including both backgrounds of the game's Special Stage. By clearing every piece on the board, the player can score big with clean-up bonuses. Once the player reaches level 30, a fourth color is introduced: white. The game continues until the board is completely full and there is no more room to drop further pieces, or until the player reaches either the maximum score of 9,999,990 points or level 99, in which case the player's clear time will be displayed on the high score table. Players compete for daily high scores and can also go head to head, racing to either obtain 300,000 points or survive longer than their competitor. If the player knows what he or she is doing, SegaSonic Bros. can be completed in less than three minutes by maxing out the score. The big points come from multiple clean-up bonuses, when more than four rows of blocks are in play. This is easiest to achieve on the easiest difficulty, before the white Sonics come into play. Traditionally Sega's arcade games are given a "location test" before national (and international) release. While hints were dropped about SegaSonic Bros. across 1992, the game failed to generate the interest or revenue expected from the company during this testing period, and so was quietly removed from service to little fanfare. This short, Japanese-only run meant that most of the world were unaware of its existence for the best part of 25 years. Al Nilsen, thought to be referring to the title, suggested it was "unsatisfactory" when discussing the 1993 release of SegaSonic the Hedgehog. It is not thought to have been publicly mentioned again until a couple of overlooked posts on Twitter from 2014 and a few posts by Custom Robo developer Kohji Kenjoh on SEGA's social media website it-tells from late 2013 appeared. In early 2016, a working PCB was found by arcade board collector "ShouTime". The game was subsequently dumped and preserved, but kept away from the public through fears it might lessen the chances of obtaining future undumped games (the idea being that when a game is dumped, the value of the arcade board plummets, so those against preservation would not deal with ROM dumpers). Instead, the game toured some gaming events during 2017 and 2018, where visitors could play the game. 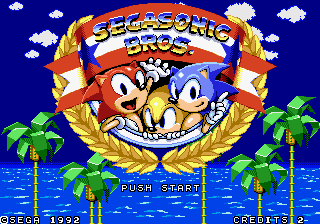 SegaSonic Bros. was leaked onto the internet in late 2018, with a modified version of MAME being released shortly after which would play the game (internal politics currently prevents the game from being added to the main branch of MAME). Similarities in the hardware allowed for an unofficial conversion to the Sega Mega Drive to appear within a few weeks. 1992 UFO Mini: SegaSonic 1993 Sonic the Hedgehog | SegaSonic Popcorn Shop 1994 Sonic's Space Tours 1997 Sonic the Hedgehog AWP 2002 Sonic & Tails Spinner 2003 CR Sonic 2007 Sonic Spinner 2008 Sonic Live! This page was last edited on 6 April 2019, at 10:17.